It was standing room only in the McKinley Doyle-Forman Theater on the evening of March 7. Students, faculty, university administrators, and AU friends and neighbors gathered to hear award-winning writer and filmmaker Stanley Nelson talk about his long and distinguished career producing documentary films about the experiences of African Americans. Nelson was the featured speaker at the second annual Gary Braithwaite Memorial Lecture, sponsored by the College of Arts and Sciences Department of History, the School of Communication, and the Center for Diversity and Inclusion, and underwritten through the generous support of AU alumnus Michael Schwartz. Some of Nelson's notable films include Freedom Summer (2014), Freedom Riders (2010), Wounded Knee (2009), Jonestown: The Life & Death of Peoples Temple (2006), and The Murder of Emmett Till (2003). His latest film is The Black Panthers: Vanguard of the Revolution (2016). Nelson told the audience how he came to be a filmmaker. He grew up in New York City in the 1950s and 60s, when he says there were no black people in the movies or on TV. He discovered film in college, and knew he wanted to make a life in it. He was always interested in going beyond the superficial to document times and places through the lives of the people who lived through them. "One of the things I always wanted to do from the very beginning," Nelson says, was "tell stories from the inside out." He produced his film about the Freedom Riders through the lens of those who were part of it. "It became this mass movement. It was not just one person's story." He adds, "I think it's really important that people tell stories about what they know about, and from the cultures that they come from." 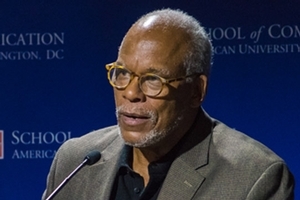 Stanley Nelson is a fellow of the American Film Institute, the New York Foundation for the Arts, the Washington DC Commission for the Arts, and a Revson Fellow at Columbia University. He has won a MacArthur "Genius" Fellowship, and an individual Peabody for his body of work. Other honors include five Primetime Emmy Awards and the 2016 Lifetime Achievement Award from the National Academy of Television Arts and Sciences. In 2013, he received the National Humanities Medal from President Obama. "One of the things that has driven me throughout my career," he said, "is knowing that these stories are really precious, and that they might not be told again ever, or for years and years and years, and I have to tell them right." He adds, "It's a real honor to have been able to tell these stories." The lecture series is named for AU alumnus Gary Braithwaite, who passed away in 2008. He received his bachelor's degree in history and American Studies in 1975, and a master's degree in history in 1977, both from AU. His career focused on helping students win federal Pell Grants, to enable them to attend college. One of Braithwaite's professors and mentors was CAS University Professor of History Alan Kraut, who hosted the evening and co-teaches a course called Producing the Historical Documentary with School of Communication Associate Professor of Film and Media Arts Maggie Stogner. Braithwaite, Schwartz, and Lonnie Bunch—founding director of the Smithsonian National Museum of African American History and Culture—were all students of Kraut when he joined the AU history department in 1974, and Braithwaite's widow, Melissa Kirkpatrick, became his doctoral advisee. "They were all talented, enthusiastic, and memorable," Kraut says. "Gary's interest in engaging the past through film made the selection of documentary filmmaker Stanley Nelson as this year's Braithwaite lecturer a great fit, as did Nelson's work with Lonnie on a film for the magnificent National Museum of African American History and Culture that Lonnie created." Kraut adds, "Being together with Melissa, Michael and Lonnie to honor Gary's memory made the evening one I will always warmly recall." Stanley Nelson and audience. Photo: Jeff Watts. Professor Maggie Stogner, filmmaker Stanley Nelson, Professor Alan Kraut, Braithwaite lecture underwriter Michael Schwartz. Photo: Jeff Watts. Stanley Nelson and Lonnie Bunch, AU Alumnus and Founding Director of the Smithsonian National Museum of African American History and Culture. Photo: Jeff Watts. College of Arts and Sciences Dean Peter Starr and Lonnie Bunch. Photo: Jeff Watts. Michael Schwartz, Alan Kraut, Dr. Melissa Kirkpatrick (widow of Gary Braithwaite), and Lonnie Bunch.